Plus a new app for food foragers. The Pastry of the Moment is the cronut — a New-York-invented, croissant-doughnut hybrid that has inspired a Beatle-mania-like craze in its hometown. Here in the East Bay, we've seen our share of popular pastries as well: In 2009 there was a frenzy for Pizzaiolo's doughnuts, which sold out regularly by 10 a.m. More than two years ago, Starter Bakery's kouign amanns made a much-hyped debut, and for a while they seemed to be everywhere a good cup of coffee could be found. 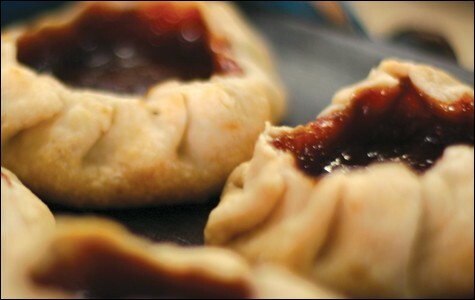 1) Turnovers from Pizzaiolo: Sometimes they're filled with walnut paste, other times with a couple spoonfuls of homemade jam. But their crusty pastry exterior is always the same: sweet, flaky, and buttery. Sometimes you get a dense, crunchy, sugar-crystal bite. There really isn't a low point to a Pizzaiolo turnover. 2) Guava Jelly Tart from Cosecha: When Dominica Rice, the chef at Old Oakland's Cosecha (907 Washington St., Oakland), first tasted guava jelly tarts in Brazil, she immediately knew she wanted to serve them at her own restaurant one day. The tarts have a fine, tender, buttery crust (Rice uses the sweet tart crust from Tartine's cookbook), and the deep rosy-pink membrillo filling (fruit paste, in this case guava) is chewy, bright, and sweet. Rice orders the membrillo directly from the Dominican Republic or Brazil, which means that it's unlikely you'll find these jewels anywhere else in the area. 3) Sour Cherry Cookie from Bartavelle: Tiny and not too sweet, these little morsels, available at Bartavelle (1603 San Pablo Ave., Berkeley), are just the right size for eating with a macchiato. Every ingredient is detectable on the tongue: Fresh ground almonds provide most of the cookie's substance; egg white and sugar give it a meringue-y chew; and inside there's a surprise: a single dried sour cherry. And, incidentally, they're gluten-free. 4) Churros from Duende: Churros can be found on the streets of Mexico and Spain, which explains why they're served, made-to-order, at the bodega of Spanish restaurant Duende (468 19th St., Oakland). Made with Central Milling flour and the restaurant's hoji blanca (a mild, buttery olive oil), this churro has a gooey inside and crunchy outside. And although Duende doesn't advertise it as such, the treat is vegan. So is the accompanying spicy chocolate dip — it's made with Valrhona and TCHO chocolate, its sweetness perfectly balanced against the heat of chili flakes. 5) Coconut Pastel at Caña: They look rather humble in the pastry case: as square and as flat as a handkerchief. But the Cuban turnover is delicately flaky, with a mellow, sweet coconut jam filling reminiscent of the coconut tarts you'll find at dim sum restaurants. On Grand Lake farmers' market days, when the coffee lines are unwaveringly and dishearteningly long, go to Caña (530 Lake Park Ave., Oakland). Ask for the pastel to be reheated — they reheat well — while your coffee is being brewed. 6) Muffins from Grease Box: Baked goods that are made without dairy or wheat often seem well, lacking, but not the muffins at Grease Box (942 Stanford Ave., Oakland), which are often filled with fruit and dusted with sugar. Chef Lizzy Boelter uses a cake-like recipe from the classic cookbook Joy of Cooking, but swaps the wheat flour for her own mix of millet, rice, and tapioca flour to create a moist, cornbread-like texture and flavor. Foragers and the open-source community have a lot in common — they're both interested in the free exchange of something valuable, whether it's oranges or code. So it seems natural that Forage City, an app that facilitates the giveaway of free food, is open-source so it, too, can be shared. The app allows anyone to create his or her own Forage City website, on which users with excess food post what they have to share. Those in search of food can log in and find what's available in their area. They can claim it online and pick it up in person. "We want to share the goodness in the fullest sense by inviting people to hack into the code, and be a part of the sharing economy that is growing around the country," said Elisabeth Soep, co-founder of the Mobile Action Lab, where the app was created. The Mobile Action Lab, part of Oakland's Youth Radio, gives youth the chance to invent mobile applications. In this case, the idea came from Forage Oakland founder Asiya Wadud, who for several years had been coordinating the harvest and free distribution of neighborhood tree fruit. The two organizations began collaborating, and over the course of two years, Oakland teens worked on the look and feel of the application with professional software developers and designers. Initially, the application focused on tree fruit, but the concept evolved. Now, all kinds of food can be exchanged: backyard-grown kale, farmers' market excesses, or bread from a bakery. At the Code for Oakland hackathon last year, the idea of making the whole platform shareable was born. The code was released a few months ago and can be found at ForageCity.com. So far, no one has launched a Forage City site. According to the Mobile Action Lab's co-founder, Asha Richardson, the lab is looking to partner with food-justice organizations and wants to support them with the launch of a Forage City community. Hopefully, it'll happen soon.